Hanna Lorann is five! This past week I was thinking that next year at this time we will only get two more of these stretches before she reaches 18! These five years were full, but truly flew by! Wow. This was the first year that she had an idea for every part of her celebration, from decorations, food, dessert, gifts, and activities. 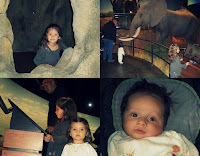 Sunday, the day before her birthday, Espi and I surprised her with an afternoon at one of her museum choices, the new and improved Wild Life Experience. This museum went from boring to amazing in the last couple years! We played there for about 3 hours, moved pretty quickly, and still didn't get to all the exhibits. Now one of my favorites in the Denver area, I look forward to enjoying this museum more and more as the children get older. Tucking her into bed the night before her big day, Hanna gave the reminder that we needed to blow up balloons and LOTS of them! So Espi and I set up decorations, including lots of balloons. 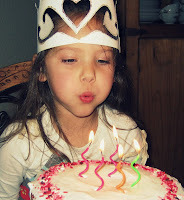 Everything was ready other than I needed to finish up her cake and make a birthday crown that she had requested. Last minute details can often hurt. The two layer cake didn't have enough frosting to cover all of the sides and the crown had some resemblance to a Greek god's helmet with wings on the sides! Yesterday, her birthday morning, was pancakes with berries, opening presents, then off to play with some friends. We returned just in time to grab some quickie-lunch-food for the truck ride to the ice skating rink to play with cousins. Hanna ice skated using the walker or held hands with me mostly. However, she had a good stretch of skating with no help at all and was very proud of not falling. Once the hour and a half of skating was over, we sang "Happy Birthday" with Strawberry Pop cupcakes (a recipe from my grandma and mom), and then pretty much let the kids run around until they collapsed into vehicles for heading home. Her day finished with hot dogs, oven fries, and moon squirters (aka cherry tomatoes) for dinner before we broke out her strawberry cake with heart sprinkles and ice cream to reinforce her very special five-year-old birthday wishes. Whew! Are you tired!? I am kinda tired! We all slept pretty well last night, and the girls (and even I) took some nice naps today, too!